The kalash yatra is a sacred and auspicious ritual where pure water is carried in a kalash/pot to be offered for consecration at a temple. The priest sanctifies the offering with invocations calling for blessings from all the deities before use in the rituals and abhisheka to follow. The kalash when filled with water is known as purnakumbha representing the inert body which when filled with the divine life force gains the power to do all the wonderful things that makes life what it is. The water in the kalash symbolizes the primordial waters of the milky ocean from which the entire creation emerged. 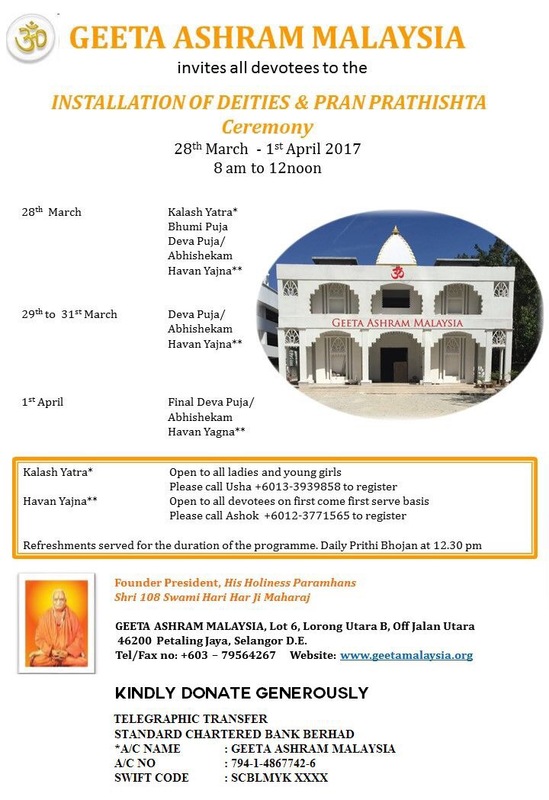 This auspicious ceremony is being held in Geeta Ashram Malaysia on 28.03.2017 @ 0800H. We are looking for 108 ladies and young girls to carry the Kalash – and our list is filling up really fast! If you would like to be a part of this opportunity of a lifetime – please give your names and contact details to Mdm Usha +60133939858.